Successfully Added M-Horse Pure 1 Android Phone - Android 7.0, Dual SIM 4G, 5.7 Inch Display, Quad Core CPU, 3GB RAM, 32GB Storage, 4380mAh (Black) to your Shopping Cart. Android 7.0, 3GB RAM, fingerprint scanner and dual SIM 4G all on an affordable phablet device with a 5.7-inch screen only with the M-Horse Pure 1. The budget phone with high-end ambitions. 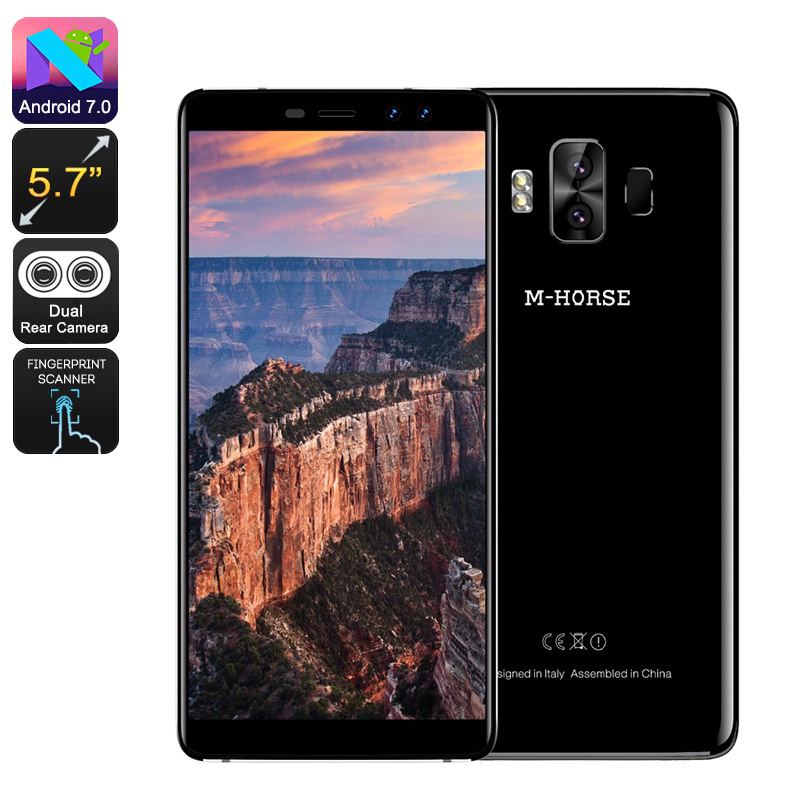 As well as its good performance the M-Horse Pure 1 has a respectable design that includes a rounded curved body that makes the 5.7-inch smartphone sit comfortably in the hand. A quad-core MTK6737CPU and 3GB of RAM bring a solid performance that is sure to impress with its ability to handle multitasking and games. You will also have plenty of space for all your media files and apps with 32GB of onboard storage and a micro SD card slot supports up to 256GB for easy expansion. You can enjoy good cellular connectivity across 3G and 4G with the latter have support for B1/B3/B7/B8/B20 frequencies. This means you get good coverage across a range of countries and makes the phone appealing to frequent travelers. You will also benefit from the large 4380mAh battery that will bring good usage times and means there's no issue going more than a day between recharging. To the rear is a dual camera setup that makes shooting photos fun and enjoyable. You will also benefit from the improved security that comes with having a fingerprint scanner so all your contacts and valuable data will be kept safe and secure.